For many people, a trip to the Holy Land is a form of genealogical research. Like DNA, it tells us something about our deep ancestry. In March 2012, Marilyn and I took a two-week trip to the Holy Land with Paul and Maryann Knag. The title of the tour was "Sacred Land: Common Ground?" We not only visited the ancient land of our religious heritage but also spent time meeting with the people who live there today. The trip was sponsored by the Yale Divinity School. Our leader was the Harold Attridge a New Testament scholar and Dean of YDS. Harry was retiring as the Dean, but he was to continue on as Sterling Professor, an appointment announced just before our trip. Harry is a Roman Catholic layman and previously taught at Southern Methodist University and the University of Notre Dame, where he also served as dean of the College of Arts and Letters. He holds degrees from from Boston College, Cambridge University, and Harvard University. Harry gave us mini-lectures once or twice a day and was a most gracious host. Harry was accompanied by his wife Jan. Jan had been publisher of America magazine. She knew my cousin Peggy O'Brien Steinfels, who had been editor of Commonweal magazine, and her husband Peter. Jan and Harry had been on a program put on by Peggy and Peter at the Fordham Center on Religion and Culture. The leadership team also included YDS staff John Lindner and Connie Royster and YDS students Christina Baik (from Wilmette) and Elaine Thomas. Also on the team was our travel agent, Kate Peer, President of Group Travel Directors, Inc. in Minneapolis. We were invited to go on the trip by Paul and Maryann. Maryann had received a Master's degree in Bible Study from YDS a few years earlier, and she was my Bible teacher at Saint Thomas More Church in Darien. A year earlier we had gone on a trip to Greece and Turkey at the invitation of Paul and Maryann. Kate Peer, our travel agent from Minneapolis (Skype presentation). There were 34 people in our group, including our leaders. In addition, we had a driver and a tour leader from East Jerusalem, Naim Khoury. Naim was born and attended school in Jerusalem. Later he traveled to Germany to study Archaeology and History. Naim was licensed as a guide prior to the Six-Day War of 1967. He guided Pope Paul VI and together they planted an olive tree. He has guided tour groups for Group Travel Directors for fifteen years. I summarized our trip in emails to our children at the end of each day, sent on the iPad they gave us the previous Christmas. What follows is based on those summaries. March 6: Our bus waiting for us in front of the Grand Hotel in Bethlehem. Maryann Knag is on the top step. 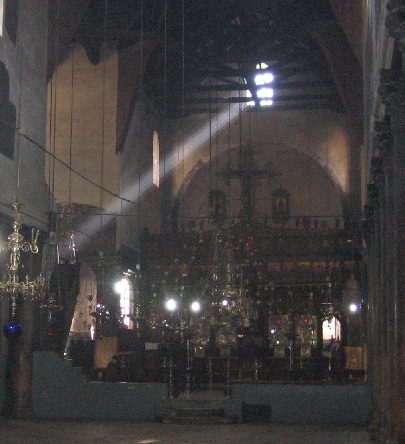 March 6: Basilica of the Church of the Nativity, maintained by the Greek Orthodox Patriarchate of Jerusalem. The basilica is entered through a very low door, called the "Door of Humility." The wooden rafters were donated by King Edward IV of England. Stairways on either side of the Sanctuary lead down by winding stairs to the Grotto. Bethlehem. Our first stop was in Bethlehem, where we stayed at the Grand Hotel. We went to the Church of the Nativity, built over the cave that tradition marks as the birthplace of Jesus in Bethlehem. We then went to the Herodian, a fortress built on the top of a mountain by King Herod. We met with six students at Bethlehem University. We visted a family in a refugee camp. We visited the al-Ibrahimi Mosque, where Marilyn put on the wrong pair of shoes. March 6: Six students who met with us at the University of Bethlehem, a Catholic school open to all faith traditions (one-third Christian and two-thirds Muslim). 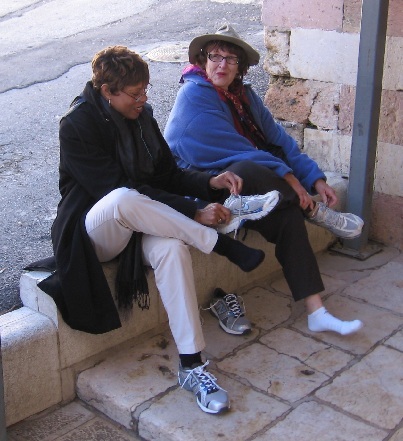 March 7: Marilyn exchanging shoes with Yolanda Smith in Hebron outside the Cave of the Patriarchs, now the al-Ibrahimi Mosque. We had to take our shoes off when entering the Mosque, and Marilyn put the wrong pair on when she left. The Cave of the Patriarchs is in the heart of Hebron's old city in the Judean hills. The shrine is the world's most ancient Jewish site and the second holiest place for the Jewish people, after Temple Mount in Jerusalem. According to the Book of Genesis, the cave and adjoining field were purchased by Abraham some 3700 years ago. Abraham, Isaac, Jacob, Sarah, Rebecca, and Leah, considered the Patriarchs and Matriarchs of the Jewish people, are all believed to be buried there. Jerusalem. On the morning of Thursday, March 8, we got in our bus and went to to Jerusalem. We picked up Daniel Seidemann (whom we had met at Yale before our trip) in East Jerusalem, and he took us to Ramat Schlomo, an Israeli Settlement from which we could view the Shu'fat refugee camp to the east, established in 1965. From the eastern edge of the Ramat Schlomo Israeli settlement, we could see The Shu'fat refugee camp, established in 1965, population 35,000. We realized that our trip through the tunnel had every sign of becoming a disaster. Some of us, including me, could not walk very well, and we felt increasingly nervous when we saw we would have to descend several steep spiral staircases. They were made of icy, slippery steel, curving round and round into darker and darker levels. . . . As a group, we changed. Our titles, our ages, our backgrounds didn�t matter. Some of the more athletic and well-prepared members of our party swiftly came to the rescue of the fragile ones. They walked in front of us; they shined little pocket lamps at our feet; they held our arms and braced their legs and bodies against us so that our feet would not shoot out from under us. We moved slowly. We had no idea where the passage was leading. The passageway curved back and forth under the mountain. Our hotel was just north of the Old City, where we have a view of Herod's Gate. We had three speakers the first day--a Zionist public policy wonk, an archeologist, and a women's rights woman. Early the next morning, Peter went over to the Old City by himself before the tourists arrived, entering through Herod's Gate, walking along the Via Dolorosa, and returning through the Damascus Gate. Our group then started at the Holocaust Memorial, which is quite impressive except that they blame the Pope for not doing more than he did. Then we went to the Israel Museum, which includes an exhibit on the Dead Sea scrolls. After lunch we had a tour of the area where Jesus died and was buried conducted by John Peterson, a Canon from the Episcopal Cathedral in Washington, DC. He was an archeologist and quite knowledgable. We then had a private audience with the Greek Orthodox Patriarch of Jerusalem, Theophilos III. We were served small glasses of wine. On our way out each received from Theophilos III a wooden Holy Spirit pin and a photograph of the Church of the Holy Sepulcher. 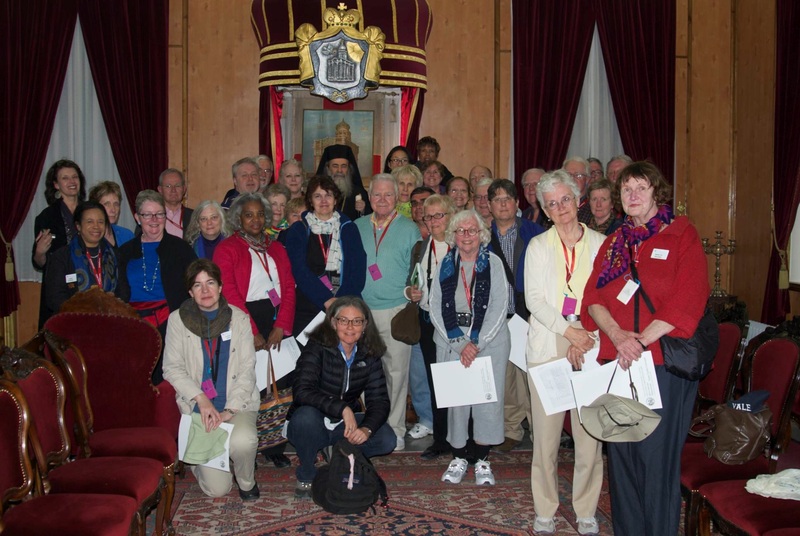 March 9: Our private audience with the Greek Orthodox Patriarch of Jerusalem, Theophilos III. Notice Maryann and Marilyn in foreground. Photo by Debbie McLeod. Larger image. On the third day in Jerusalem, we visited the Dome of the Rock and had a private audience with the Grand Mufti of Jerusalem, Muhammad Ahmad Hussein. It was arranged by Jordanian Prince Ghazi bin Muhammad. We then went to the Centre for Jerusalem Studies and met Huda Al-Iman, Director of the Centre, and Sari Nusseibeh, President of Al Quds University. We left the Old City and went to St. Joseph Parish in Jifna, where we had lunch with Fr. Firas Aridah and a representative of Catholic Relief Services. Next we went to Ramallah where we visited the tombs of Yasser Arafat (1929-2004) and poet Mahmoud Darwish (1941-2008). This was followed by dinner at the Moevenpick Hotel where we met with a Communications Advisor from the PLO Negotiations Department, Xavier Abdel Aziz. This was a first class hotel, where Peter was able to put the Bulletin on the parish website back in Darien. On Sunday, we went to 9:00 Mass at Ecole Biblique with the Catholics in our group. The subgroup consisted of 14 of 34 in our group, including Dean Harry Attridge and his wife Jan. Mass was celebrated by a Dominican archeologist. We visited Stations 1 and 2 on the Via Dolorosa: Jesus is condemned to death, and Jesus takes up His cross. At one time they thought the Praetorium had been discovered there. In the middle of the day, we went to the Mount of Olives. First we went to the Augusta Victoria Hospital, which is funded by the Lutheran World Federation. We met with the CEO of the hospital, Tawfiq Nasser, and Mark Brown, regional representative of the federation. We had lunch at the hospital. Then we walked the path that Jesus took when he entered Jerusalem on Palm Sunday. Then we went to the Garden of Gethsemane, which has olive trees that are 2000 years old. There is also a tree planted by Pope Paul Vi in 1964. It was carried to the Garden by our guide, Naim Khoury. On the way there, Naim showed us a story in the Jerusalem newspaper about our group. Later in the day, we went to the Church of the Holy Sepulchre with John Peterson and then to St. George's Anglican Cathdral for dinner and discussed the progress of our tour. That night, Peter wrote to the kids: "don't worry too much about what has happened at Gaza Strip. We are far away from it." Jericho. We left Jerusalem, drove over to the Dead Sea, and headed south along the west coast of the Dead Sea to Masada, in the Negev Desert. We took a cable car to the top of Masada, a fortress built by Herod in 37 to 31 BC, and a place where the Jews made a last stand against the Romans in 72 AD. Then we went back north to Ein Gedi on the Dead Sea, 1,388 feet below sea level, the lowest place in the world, where we had lunch and went swimming. Marilyn had a fall on the way down to the swimming place. We had a Yale doctor in our group, Leo Cooney, who specializes in geriatrics. He took a look at some bleeding and said Marilyn was OK. It was a particularly steep and rocky descent to the water's edge. So, Mom did not swim. Then we went to Qumran, where the Dead Sea Scrolls were discovered in 11 caves starting in 1947. Our leader Harry Attridge is particularly knowledgable in this area. We stayed one night at the Jericho Resort Hotel, and had a nice dinner there with our group. 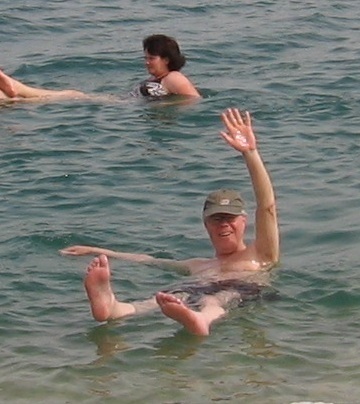 March 12: Peter floating with no hands in the Dead Sea at Ein Gedi, 1,388 feet below sea level, the lowest place in the world. 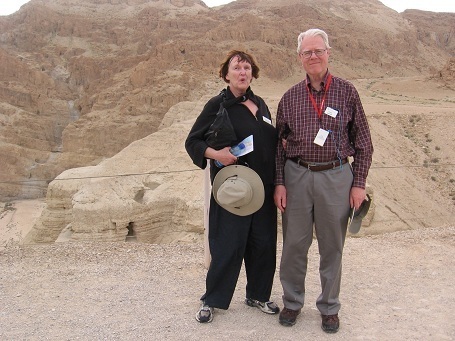 March 12: Peter and Marilyn at Qumran. Cave 4 can clearly be seen. It is an artificial cave cut into the cliff face by men. Several hundred scrolls were found in the cave. It was found and opened up in the 20th century by local Bedouin who had been searching for scrolls. Tiberias. We travelled from Jericho to the Sea of Galilee. We started at Old Jericho, which goes back 11,000 years. We took a cable car from there up to the Mount of Temptation, where Jesus was tempted by the Devil. We then drove up along the Jordan River to Beit She'an. As we drove, we could see Jordan on the other side of the river in the distance. At Beit She'an, there are extensive Roman ruins, including an amphitheater. From there we drove to Nazareth and visited the Church of the Annunciation, built over the site where Tradition holds that Mary lived and where the Angel Gabriel told Mary she would be the Mother of Jesus. The current church was built in 1969. It is quite impressive with Marian artwork from countries around the world. We attended Mass there in the lower church by the grotto that reveres the site of Mary's home. We then drove to Tiberias on the Sea of Galilee, where we stayed at the Restal Hotel for two nights. The next day we started with the house of St. Peter in Capernaum on the Sea of Galilee--ancient ruins of a church said to be built over the house of St. Peter. Above the ruins is a modern church. The Sea of Galilee is very peaceful. Then we went to the Church of the Beatitudes near Capernaum and Tabgha. Here since the fourth century, there has been a church commemorating the place where Jesus is said to have delivered the Sermon on the Mount. It also is the place where Jesus told Peter "on this rock I will build my Church." We then drove to the Golan Heights, stopping at Gamla, a beautiful hill overlooking the Sea of Galilee where there are ruins of an ancient Jewish city. They are also raising Griffon vultures to save them from extinction. We then drove along the Syrian and Lebanese borders to the North Golan Heights. On a winding road through Majdal Shams we could see snow-capped Mount Hermon in Lebanon. We saw Israeli and UN military forces and tanks along the way. Israel took the Golan Heights from Syria in 1967 and later annexed the Golan Heights but the UN does not respect the annexation. Our next stop was back in Tabgha at the Church of the Multiplication on the Sea of Galilee. For lunch we had St. Peter's fish, tilapia zillii. Harry Attridge shared some biblical history with us in a conference room after lunch. We ended our day viewing a 2000 year old boat of the type that Jesus and the apostles used. We then had a boat ride out into the Sea of Galilee in a newer larger boat, singing some Gospel songs including one about the Sea of Galilee. Haifa. We left Tiberias and went to Ibilin, where we met with Archbishop Elias Chacour of the Melkite Catholic Church. He was a dynamic speaker, reminiscent of Bishop Fulton J. Sheen. He started schools after being assigned to Ibilin in 1965. His schools now have an enrollment of 4,500, including Muslims, Christians, and Druze. We had lunch there and talked to children in the school yard. We then went on to Haifa, a port city on the Mediterranean. We stopped at the shrine of the Bab, an impressive place on a hillside in the middle of the city. He was a founder of the Bahai Faith. Peter mentioned some in our group that he grew up in Wilmette when the Bahai Temple was under construction. We ended the day at the Stella Maris Guesthouse, which is run by Carmelite fathers, brothers, and nuns at the head of Mount Carmel. We met Sister Marie Reine who is from Beirut Lebanon. The Carmelite order was started near here in 1212. Jaffa. We left Haifa and went to Caesarea. We stopped at a Roman aqueduct that supplied water to Caesarea, both of which were built by Herod in honor of Caesar Augustus. The aueduct runs along the beach on the Mediterranean. It was a windy and wavy day. Peter brought a shell back and Marilyn brought a rock with holes in it. Marilyn fell going down to the beach but she was OK. Mom brought a cane but never used it. Kathleen Cooney gave her a ski pole. Mom had been using the ski pole but had left it in the bus thinking she would not need it on the beach. We then went to view the ruins of Caesarea, including a hippodrome. St. Paul was convicted at the Praetorium in Caesaria and the sent to Rome for appeal, where he was martyred. Caesarea is on the Mediterranean. Today was particularly windy with big waves. We had box lunches from Stella Maris and drove on to the old city in Jaffa. There we saw the Church of St. Peter. In Jaffa, Peter raised Tabitha, a disciple of Jesus, from the dead. Also here, Peter learned that Christians need not follow Jewish dietary laws when he saw a vision of all kinds of animals and heard a voice say, "Arise, Peter; kill and eat!" We then went to the U.S. Embassy in Tel Aviv. There we met for an hour with Robert Silverman who is the ambassador's senior political advisor. Peter asked him why we could not reduce our aid to Israel and increase our aid to the Palestinians. Robert did not answer and simply said, "Let's move on." In Tel Aviv, we saw a lot of wind surfers. We went to the Grand Hotel in Tel Aviv and then to dinner at Abu Nassar-Hinnawi restaurant in Jaffa. 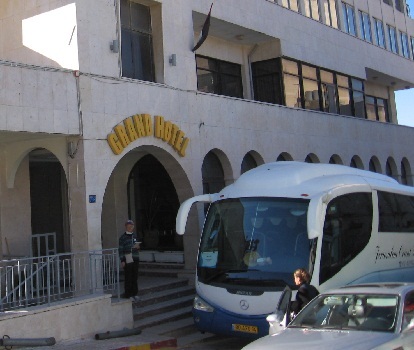 At the hotel, there was an incident where it appeared that our Palestinian guide, Naim Khoury, was not going to be allowed to stay at the hotel. Many in our group were up in arms about it. Our travel agent, Kate Peer, straightened it out. A number of our people have had colds or the flu. Today, one went to the hospital with our doctor, Leo Cooney, to get a blood test and chest Xray. Leo was concerned because she had recently been treated for breast cancer and had taken antibiotics for a cold. The next day we had a wake up call at 5:30 for our return flight. It was a great trip, but we were to glad to be getting home.